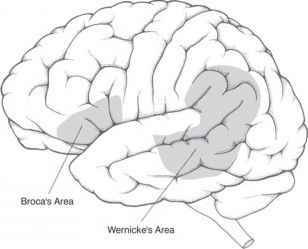 Weidenreich believed that as the brain expanded from its primitive apelike state, a number of changes in cranial anatomy occurred. Without knowing what many of the unique anatomical traits of Sinanthropus meant, he struggled to interpret them in an evolutionary progression from ape to modern human. He compared the supraorbital tori—the large bony ridges projecting from above the eye sockets—to similar large structures in apes. He measured the length and breadth of the braincase and compared its long and low shape in Sinanthropus to that of ape skulls. He measured the position of the foramen magnum, the hole in the base of the skull through which the spinal cord passes, and noted that it was located more to the back of the head, again, more apelike than in modern humans. Where Sinanthropus differed from apes, Weidenreich attributed the change to progressive evolution toward Homo sapiens. For example, he noted that what little was known of the Sinanthropus facial skeleton showed a reduction in its overall size, and the canine teeth of Sinanthropus were reduced in size and humanlike in form. Weidenreich was too good an anatomist not to realize that some aspects of the strange skull form that he had discovered and described in Sinanthropus did not make sense in terms of brain size expansion alone. He observed and named a new structure—the "torus occipitalis"—a linear bony thickening that ran from side to side at the back of the skull. Apes do not have such a structure, although they may have a sharply defined shelf of bone at the back of their heads to which the strong neck muscles attach. Anatomy of the Homo erectus skull as reconstructed by Franz Weidenreich. The skull has a low and elongated form as compared with modern humans. A massive buildup of bone above the eyes, the supraorbital torus, and a thickening of bone at the back of the head, the occipital torus, magnify the effect. The top of the skull shows a characteristic, rounded keel of bone down its middle, extending to flattened bone surfaces on either side. The Sinanthropus torus occipitalis was round, smooth, and completely different. It is located much higher on the back of the skull than the attachment of the relatively small neck muscles. Therefore, the torus occipitalis of Sinanthropus must be for something other than muscle attachment. Puzzled by the anatomy, Weidenreich sidestepped the issue. Avoiding a functional interpretation of the torus occipitalis, he used this trait to relate Sinanthropus to the later Neandertals, whom he considered to be ancestral to modern humans. Neandertals have a small midline remnant of the torus occipitalis, an expansion on the occipital bone known as an "occipital bun" (widely referred to by the French term "chignon"). Weidenreich explained other confusing anatomy of Sinanthropus as either irrelevant to phylogenetic interpretation or as variations that might indicate some continuity across species boundaries to modern humankind. In the first category he placed the rounded crest of bone that in Sinanthro-pus runs from the middle of the forehead back along the crown of the head. Like the torus occipitalis, this structure is a low, rounded local thickening of bone, very unlike the thin, ridge-like midline "sagittal crest" that serves for the attachment of the large temporalis chewing muscles of apes. The "temporal lines" to which Sinanthropus temporalis muscles attached are clearly preserved and located far below this structure. We now term it a "sagittal keel." 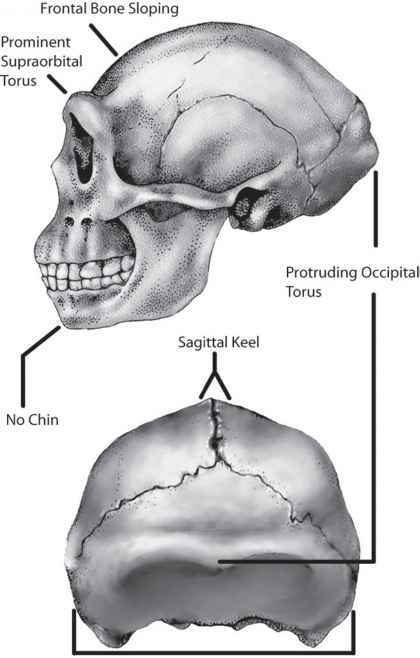 Weidenreich sidestepped the anatomical meaning of the sagittal keel, which was as puzzling as the occipital torus, and instead considered a "strong sagittal crest" in Sinanthropus one of several features which, "though irrelevant from the phylogenetic standpoint, . . . nevertheless occur in exactly the same manner and degree of formation in recent man-kind. "4 He noted that similar bony excrescences could be seen on some modern Asian, Australian, and Tasmanian human skulls. The most well-known example of a trait that Weidenreich adduced to indicate evolutionary continuity from Sinanthropus to Homo sapiens was the shovel-shaped incisor. American anthropologist Ales Hrdlicka had introduced the term in 1920 and noted it occurred frequently in Asians and American Indians.5 The type of "shovel" to which he compared these teeth is one with a blade that has upturned edges, much like an old-fashioned coal shovel. If you happen to have shovel-shaped incisors you can feel the ridges with your tongue on the back of your front teeth. Weidenreich documented shovel-shaped incisors in Longgushan Sinanthropus, whose four upper front incisors and lower second incisors generally show the trait. Modern Asians and American Indians (who have a recent Asian ancestry) have by far the highest incidence of shovel-shaped incisors among modern people, a fact that Weidenreich used to infer a Sinanthropus ancestry for Homo sapiens. By 1943 Franz Weidenreich had done an excellent job of fully describing to the scientific world all of his careful observations on the Chinese fossils from Dragon Bone Hill. Regardless of the exact evolutionary meaning of the anatomy of Sinanthropus, it was certainly different and it was certainly old. All paleoanthropologists recognized it as important and in need of theoretical explanation. 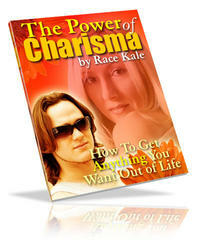 The place to start to look for answers was in comparisons with previous discoveries and what was already known. To whom or what was Peking Man related?